New and Improved - Stronger then conventional cords. They will not scratch or mar. Engineered to with stand the elements. Totally adjustable with a simple tug and locks into postion. The most convenient, versatile invention we've seen in years! Cords adjust from 6" to 48". Quantity two in each pak. Great product. 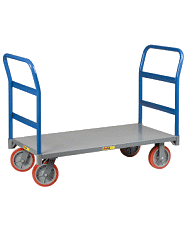 Works well with your hand trucks. Keeps everything in place. Helps a lot. . . I purchased these with the MultiCart® 8in1 Equipment Transporters R8 Mid and they help keep the awkward loads steady and intact. The hooks don't exactly fit the cart as I had anticipated, however, it works. The stretch cords are great. Where you get those cords? All my friends want to know, where you get those cords? They are the best. Perfect complement to the handtruck I ordered... The adjustability of the cords is well designed and very functional.